Maine Clam Gear Co. makes rugged clam forks, sturdy rollers, and working clam rings are the tools of the profession. High quality clam gear made in Maine and supplied across the region. Loved by clam diggers, gardeners, mushroom gatherers, farmers, & florists. Our most popular clam rake. 13" tines with solid wood handle. Austrian made steel head. 4 tined, 5 tined, 6 tined, and kids' diggers are available. 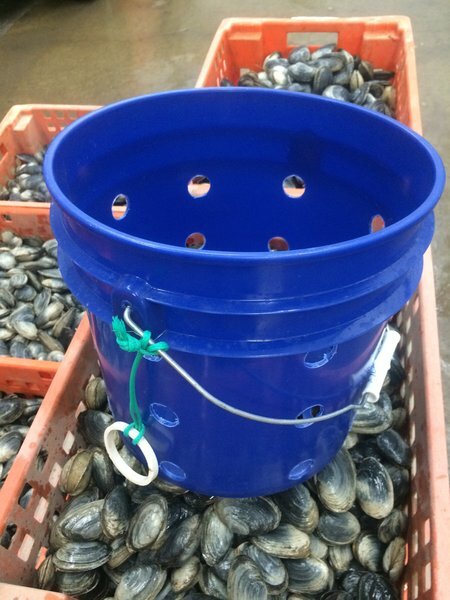 Clam bucket - 3 gallon. 1" holes. An economical container for the starter clammer. Wire rollers, kibbens, baskets, and buckets with holes for seawater drainage by bushel and peck units. Can also be used in the garden, orchard, or for beachcombing! Stainless steel clam ring used to measure size of clams for 2" legal requirement. Cut here in Maine with our GOM logo. Stainless steel clam rings, clam sacks, and clam digger tags. "Just Dig It!" Here's a perfect gift for Mom and Dad, Gram and Gramp or just for the fun of it. Kids' starter kits and individual diggers. This clamming gear has been field tested in the mud and on the rocky beaches of Maine. It survives the methodical, backbreaking cadence of millions of digging strokes by Maine clammers, as well as being tossed around in boats and on the backs of pickup trucks en route to a hard days' work.